Inking on the Edge: Your Next Stamp Blog Hop...Happy Brrr-thday!!! 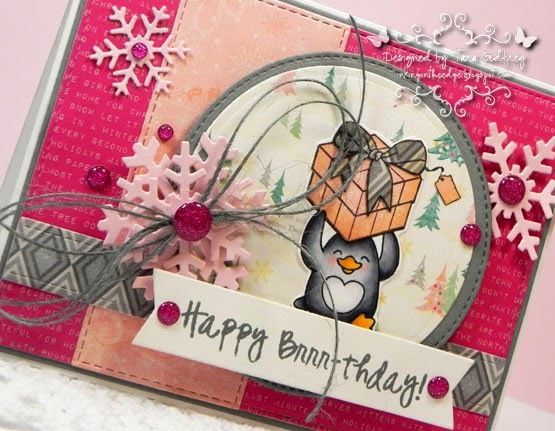 Your Next Stamp Blog Hop...Happy Brrr-thday!!! Hello stampin' friends!!! 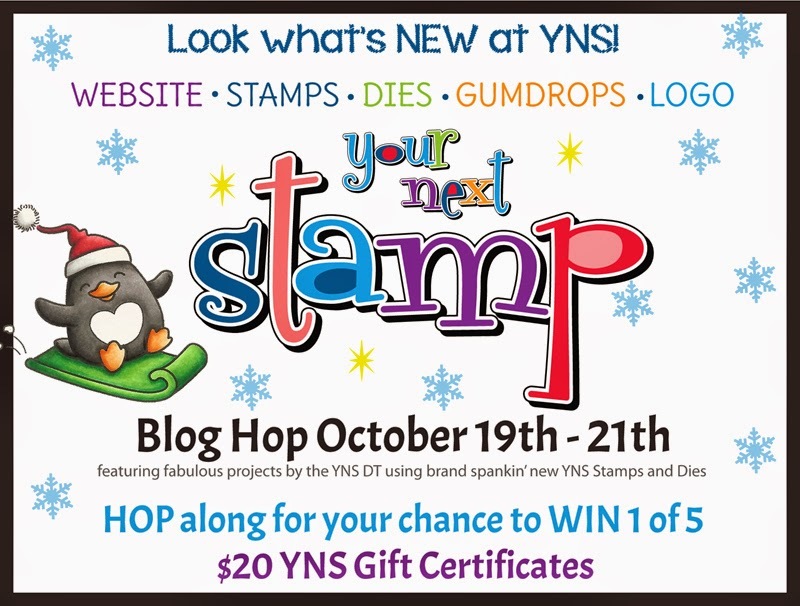 I'm SO thrilled and honoured to join Karen, her talented Design Team and many special guests for this exciting Your Next Stamp Blog Hop to mark the launch of the NEW Your Next Stamp website, the NEW October Release and the 5th anniversary of Your Next Stamp! Whoo Hoo!!!! If you landed here from Amy's blog then you are in the right spot! If not, I suggest heading on over to Tracy's blog and hopping along with us from the beginning! There's AMAZING PRIZES to be had!!! 5 random winners will receive $20 to spend in the YNS Store! Make sure to comment for more chances to WIN! Winners will be posted on the YNS blog on Oct 22! You will get 10% off your entire purchase when you create an account in the new store! Plus the new release will be marked down 15%!!! I made two wintery cards with these adorable little Waddles - Snow Fun Stamp set and of course I had to use Your Next Stamp Gumdrops! I absolutely LOVE, LOVE, LOVE these pretty Glittered Pink Gumdrops. If you've visited my blog before, you know I have just a little Gumdrop addiction ;)...they are my absolute favourite embellishment! I made my card with this pretty BoBunny Candy Cane Lane 6X6 paper pad and stamped one of the many sentiments from the Waddles - Snow Fun Stamp set. This is my second card with another one of the little Waddles from the Waddles - Snow Fun stamp set...this little tobogganing Waddle totally stole my heart...how cute is he?! I used more BoBunny Candy Cane Lane 6X6 papers and I just had to add these gorgeous Glittered Silver Gumdrops! Gosh, they are SO pretty and SO glittery! 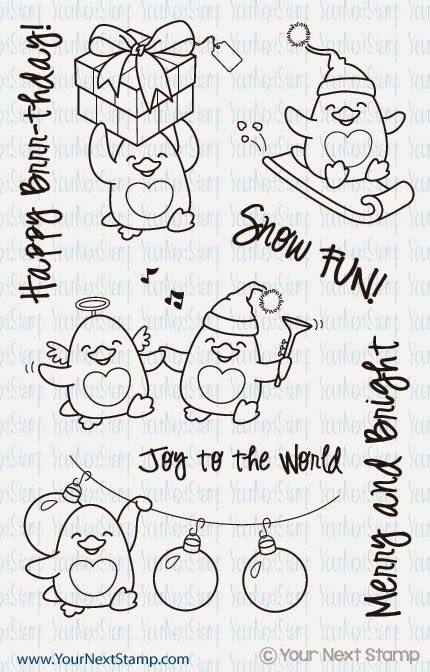 Here is a close up....I stamped another sentiment from the Waddles - Snow Fun Stamp set. Thanks SO much for stopping by and having a wee peek at my cards with the Your Next Stamp Waddles - Snow Fun Stamp set and Glittered Pink and Glittered Silver Gumdrops! Make sure you leave a comment and be sure to continue on your hop commenting along the way!!! Next stop on the YNS hop is the super sweet and amazingly talented Angel!!! Hop on over to see what stunning creation she has to share! Wow! Both of these are just so pretty! Love all your embellishing and coloring! Love the penguins. Love the soft green colors, too. 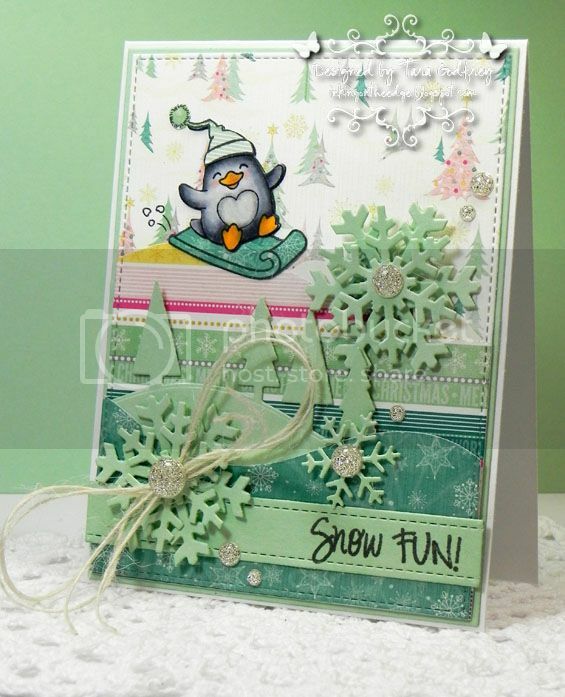 Love the colors you used for the card and that penguin stamp is too cute. Wow great cards and I love, love penguins. That stampset is adorable. Thanks for sharing. your cards are both so gorgeous. your cards are a lot of fun nicely done as well!!! Love these! What amazing work! Adorable set of penguins! I really love the color combinations you used on both your fabulous cards! It looks like both penguins are having fun - probably about as much as you had, making up these cuties!! OMGoodness these are both gorgeous! I love those penguins! Your first card is my favourite - love the colour combo! I really like how you tied the twine bow on both cards! Darling cards!!!! Love the details on both! that little penguin is having so much fun. Love the colors in your cards. Away from the traditional colors - a relief from bright red and green. Adorable penguins! You have made them look real! Your cards are decorated beautifully!!!! Love your layerings as always! love the penguins! the cards are beautiful! Oh, I love those sparkly gumdrops too. Sigh.....both cards are soooo sweet, lovely color combos you chose. Where do I begin? Both cards are so adorable! I love this stamp set. It is so usable all year, not just Christmas! General winter and birthday too, so nice! I see you like to add foam to your stamps too. I love how they give such depth. Very cute. I really like these little penguins. Wow absolutely fabulous cards! I love the designs and all the layers, just wonderful! These little guys are so much fun! You did a great job showcasing them, especially with the fun pink background! Love your cards. The snowflakes are so perfect. Your cards are so adorable! I love them both! I really love that stamp set!! So cute--I like the colors of snowflakes. Absolutely beautiful! Gorgeous colours and love the penguins! The snowflakes are such a pretty touch! Those peguons are just too adorable on your cards!! Oh my goodness!!! These cards are total eye candy! Love them! Thank you so much for celebrating with us today!!! Those little penguins are just so darn huggable! Fun cards! The colors on your cards are beautiful!!!!!!!!!!!! Great job! I am in love with your cards! They are so stinking cute! 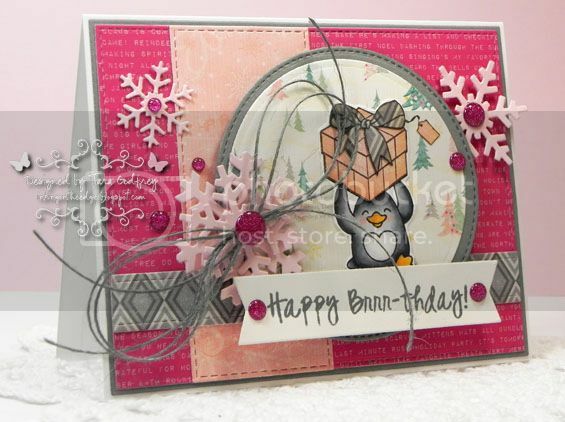 Such cute penguin cards and just love the layering. I love all the details on your cards! And Waddles is a keeper! I really love the colors on both your cards! Those penguins are adorable!! Sweet cards - the colors are wonderful! Great to have you joining us for the release! WOW! Tara your cards are GORGEOUS. I love the Candy Cane Lane line from Bo Bunny this year and you've given me such fabulous inspiration! Thanks so much for being our special guest! !